Charizard is one of our favorite Pokemon, and if you want one to call your own in Pokemon Sun and Moon, visit your local Target store. The US-based retail chain Target will be handing out Charizard codes to Pokemon Sun and Moon players next month. All you have to do to get the Flying/Fire-type, which is the final form of Charmander, is to walk into the store and ask for the code. Pokemon Sun and Moon players can acquire Charizard with the stat-boosting Dragon Dance move along with Flare Blitz, Fly and Earthquake, October 1-14. Codes for Charizard are only available while supplies last, and are valid until February 4, 2018. Probably best to just redeem the code as soon as you can so you don’t forget. Don’t forget about the other Pokemon Sun and Moon code distribution going on at the moment. From now until October 31, Mega Stones for Altaria, Ampharos, Latias, and Latios are being handed out. All you need is a code. No need to get off the couch or drive any place. Also, those in the UK still have time to get their code for the Poison/Fire Type Pokemon Salazzle. Just head to your local GAME store by September 18 to receive the code. Starting next week on September 19, through the Pokemon website, six Pikachu wearing one of Ash’s hats will be made available for download in Pokemon Sun and Moon. It’s to celebrate the release of Pokemon the Movie 20: I Choose You in select theaters. Players can pick one of six hat-wearing Pikachu to download, but only one version will be at a time and for one week. So, pick your Pikachu wisely. Watch as you receive Charizard. 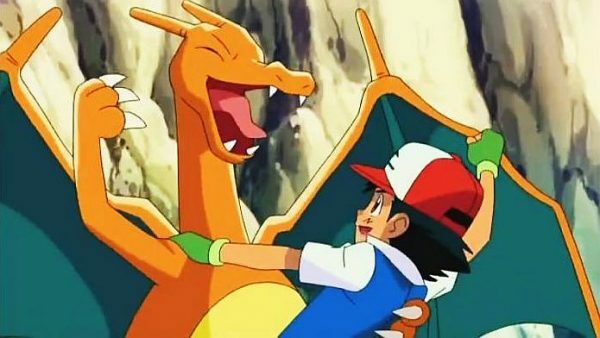 Speak to the deliveryman in any Pokemon Center to pick up Charizard.